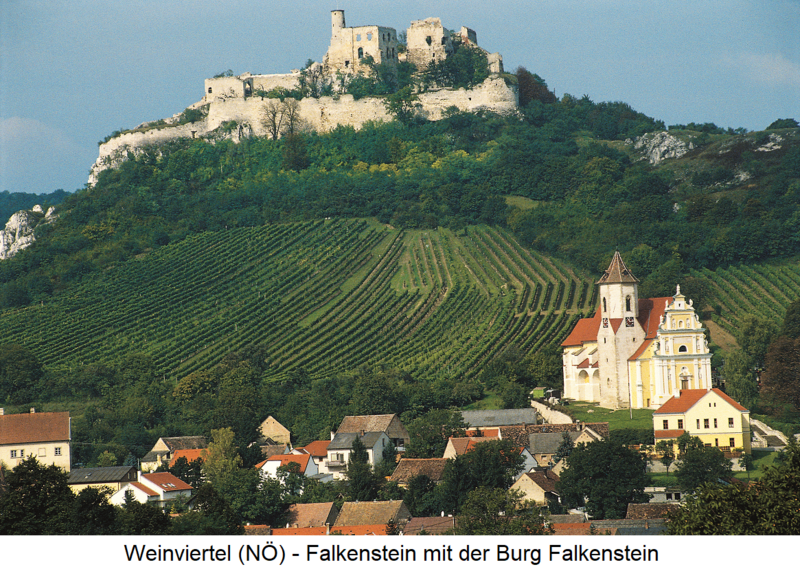 Today's Austrian wine-growing region Weinviertel in Lower Austria was formerly in the independent and designated by the respective main wine areas Retz (in the west) and Falkenstein at Poysdorf shared (in the east). Above the northeast near the Czech The bordering town of Falkenstein is dominated by the ruins of the same name, which was built around the year 1050. The vineyards cover 185 hectares of vineyards and consist of calcareous, loamy soils with sandstone admixture. They are mainly with the white wine varieties Green Valtellina (Falkensteiner is by the way an old synonym), Riesling and Pinot Blanc ( Pinot Blanc ), as well as the red wines Zweigelt. Blue Portuguese and Blauburger planted. In Falkensteiner wine trail there is an interesting show object. A small wine barrel refers to the year 1456 and the name tire biter to a particularly sour vintage, which was perhaps used for the construction of the Vienna St. Stephen's Cathedral. Well-known wineries are Dürnberg, Jauk Leo, Luckner Richard, Neustifter Reinhard - Winery Tor zur Sonne, Pichler Heinz, Salomon Joseph and Stadler Johannes, These winegrowers have become a brand community Falkensteiner mountain court together. This page was last modified at 30 January 2019 at 17:00.